My point is not that they cant predict. But is it fare to do so in the volatile environment. Are you a journalist or astrologer who rarely go right. This started with Akar Patel and now Rajdeep Sardesai, Sagarika Ghosh and Swaminathan Aiyar too have come out with their prediction of a BJP victory and how Modi is going to stay for a long haul in India. Is media realising that in the absence of a united opposition, Modi’s will remain in power for long and hence they have to make way with him otherwise they would lose business or is the media visualising that in the absence of Congress, the other parties might undo many things both the Congress or BJP have done. Is it an attempt to undermine the large scale protests and opposition to major policies of the government. The condition of Indian media is pathetic to say the least. They are licking at the moment. Of Course, many are trying to balance. If they publish one article of Sitaram Yechury, the next day they give a much bigger space to Subrahmanyam Swami. If they joke Narendra Modi then you must make a bigger joke on Rahul and his mother. Where is media covering Ms Mayawati’s rallies in Uttar Pradesh. Despite a known fact that BSP has a strong presence in Uttar Pradesh, the media did not even count them in picture. Why has it shamelessly showed its caste character when discussing BSP. A leading journalist responded saying that Mayawati does not need media but the same journalist to look fair said media is not showing her rallies. These public relations members of Bania shops are wasting your time. They get huge money for their talks and distortions. Actually distortion for them has become extortion. No channel can run if they dont get funds from political parties and corporate. And definitely not the entire money is ‘white’. 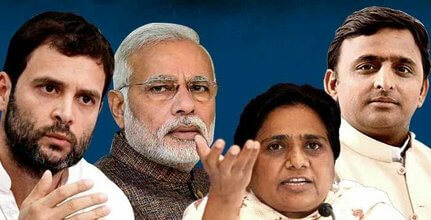 Uttar Pradesh will give its verdict on March 11th. We know it is the most important election in our history. We know it well the importance it holds for India as a whole but then defeat and win are part of political system. Cant the media wait till March 11th. We know it will not allow us to sleep peacefully even before that. It will start giving its verdict from evening of March 8th when the final phase is over. In the meantime, I can only suggest, to stop listening to these politically correct paid discourses to confuse the voters to vote in a particular direction. Capitalist Media in todays time is the biggest threat to India’s democracy. It is unashamedly and unambiguously anti poor, anti Dalit-Bahujan, anti Muslim. Can Madrassas be compared with RSS run Schools?